The Yugo Euro was a factory built prototype, the front end about 750 mm of it is hand made as well as the front fiber glass bumper. The vehicle has 1,300 cm3 DMB engine with BOSCH EFI with BOSCH +4 Platinuim Spark Plugs mated to 5 speed manual transmission. Car is equipped with air conditioning, extra gauges (tach, oil pressure, voltage), air horns, fog lights. The vehicle would have been maintenance free for 200,000 km that is no changes of any fluids or filters. 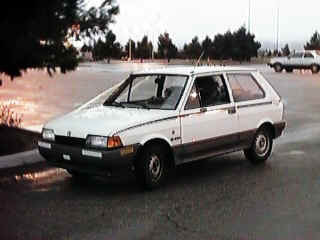 Due to the NATO bombing of the factory in 1999 the importation of the Yugo Euro was cancelled. Only 4 of the prototypes were made. The first of the hand made frond ends were made in 1998. Sales in the USA were planned for march 2000, but due to the NATO bombing all was cancelled in November 1999.